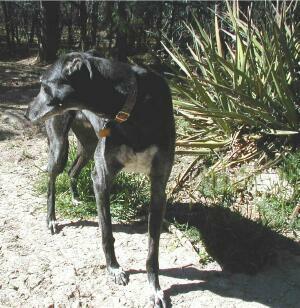 Rowdy came to us as a foster greyhound but ended up with a prolonged stay due to behavioral issues. Not the sharpest tool in the shed, he was nevertheless a very sweet boy. After a very long period in foster, we officially adopted him in November 2003. He knews all the most comfortable spots in the house, and had toys stashed everywhere. When one dog howled, Rowdy never failed to add a descant line to the song.